258 posts categorized "absentee ownership"
and, more to the point, is there a better way to do things, if an efficient economy, more jobs, less income concentration are things we value? "In a study of 2010 nationwide property tax rates, the average homeowner paid a median of 1.14 percent of home value that year, according to the Tax Foundation, a research group. In Manhattan, that figure was 0.78 percent. For the $88 million apartment at 15 Central Park West, 0.78 percent would be $686,000. But this year, the property taxes due on that penthouse were $59,000." Just think how much productive activity we could untax were we-the-people to collect some portion of that annual land rent for public purposes. And consider how unproductive the Lords of Land are. What have they done to earn that land rent? Is our "tradition" -- to let them keep it -- a wise or just one, or is it part of our wealth concentration structure? The ground beneath Trump Plaza, at 167 E. 61st St., is up for sale as land prices break records. Manhattan’s surging land costs are leaving the shareholders of an East Side luxury co-operative with a tough choice: pay a hefty price to buy the land under the building, or face increasing bills to keep renting it. The ground beneath Trump Plaza, at 167 E. 61st St., is up for sale as land prices break records. The co-op board has offered to buy the property for $185 million, a cost that would saddle residents with assessments that, for some, would top $1 million, said Adam Leitman Bailey, a New York real estate attorney who has been contacted by owners concerned about the deal before it goes into contract. The 31-year-old co-op, which makes annual rent payments to the family that owns the ground, is weighing its financial future at a time when rising prices for land make it attractive for investors to buy such property for a reliable stream of rental income. The board opted to put in a bid as it otherwise faces the prospect of a steep rent increase when the lease resets in 2024, Bailey said. “The fact that the family put it up for sale should terrify the co-op,” said Joshua Stein, a Manhattan real estate attorney who isn’t involved in the transaction. Marc Cooper, president of the co-op board and vice chairman of investment-banking firm Peter J. Solomon Co., didn’t return a phone call left at his office yesterday seeking comment on the plan to purchase the ground. Co-op residents buy shares in a corporation that owns the building, rather than getting a deed to the apartment itself, as they would in a condominium. Shareholders make monthly maintenance payments that collectively cover building costs such as mortgage payments, ground rent and operating expenses. A Trump Plaza shareholder with a 1,000-square-foot (93-square-meter) one-bedroom apartment whose monthly maintenance fee is now about $2,100 would pay about $9,800 after the rent is recalculated in 10 years, Bailey said, citing a projection by the building’s co-op board. The rent increase would be about 8 percent of what the land value is in 2024, he said. Buildable lots in Manhattan sold for an average of $657 a square foot in the third quarter, up 29 percent from a year earlier and an all-time high for the period, according to Massey Knakal Realty Services. Three purchases completed in the quarter were for more than $1,000 a square foot, the firm’s data show. Possibly difficult for those of us who see land which sells for $5,000 or $50,000 or even $500,000 per acre to fathom $500 million per acre. But that's reality! Trump Plaza’s situation is different from most other co-operatives in Manhattan, which do own the land on which the building sits and make no rent payments. Co-op units with ground leases tend to sell at a discount because they have higher maintenance costs and buyers sometimes face challenges getting mortgage financing. Other ground-lease co-ops in New York include 995 Fifth Ave., the Excelsior at 303 E. 57th St. and Carnegie House at 100 W. 57th St. The ground beneath the 324-unit Carnegie House was purchased for $285 million to a group that includes Rubin Schron’s Cammeby’s International and real estate investor David Werner, Christa Segalini, a spokeswoman for Cammeby’s, said today. The 21-story building, with an entrance on Sixth Avenue, occupies an entire block front from 56th Street to 57th Street, according to real estate website Streeteasy.com. For shareholders at Trump Plaza, buying the land beneath them means coming up with large sums of cash up front. Each owner was assessed a fee of about $2,329.40 a share, according to Bailey. A resident of a two-bedroom unit who holds 440 shares in the corporation, for example, would be charged $1.02 million, Bailey said. A 1,600-square-foot three-bedroom apartment, worth 671 shares, would get a $1.56 million assessment. Residents get more shares the higher up their apartments are in the 39-story building. The 154-unit Trump Plaza, at 61st Street and Third Avenue, was completed in 1983, according to StreetEasy. A 2,800-square-foot unit on the 32nd floor with views of Central Park is listed for sale at $3.95 million. The monthly maintenance charge for the three-bedroom, four-bathroom apartment is $7,228, according to the website. LVTfan here: One might reasonably wonder how much (a) the sellers of the land were paying NYC in property taxes; (b) how much of the monthly "maintenance charge" for the condo is paid by the condo complex to the city in property taxes (which pay for the schools and lots of other public services) and how much is for the building and its services to the condo owners; and (c) how much the land share of that 32nd floor unit is. If a 1600sf apartment gets a $1.56 million assessment, the 32nd floor apartment, at 2800sf should be roughly twice that, or about $3 million. Thus, the $3.95 million asking price on the 32nd floor is about 4/7 of the total value, or 56%; the other 44% is land value. The sale of the ground beneath the tower hasn’t gone into contract yet. Douglas Harmon and Adam Spies, brokers at Eastdil Secured LLC, are representing the owners, who are listed in public records as the estate of Donald S. Ruth and members of the Ruth family. Spies declined to comment on plans for the sale. A purchase of the land by the co-op ultimately would add resale value to the building’s apartments, Stein said. Extinguishing the ground lease permanently removes the threat that rents will reset to unaffordable levels. With that uncertainty gone, future buyers would be willing to pay more for a unit in the tower, he said. 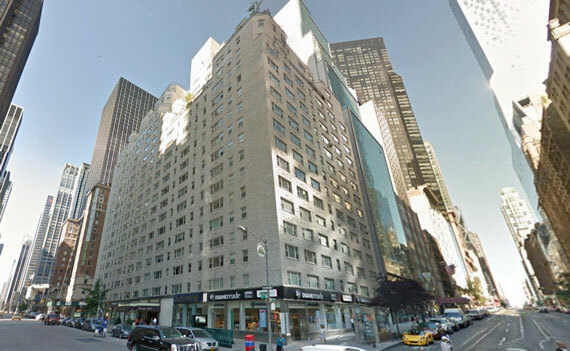 David Werner, a Borough Park investor who has wowed New York City with a series of big buys this year, partnered with Rubin Schron and the Cohen family to pay $285 million for the land under 100 West 57th Street, sources told The Real Deal. The 324-unit Carnegie House cooperative building is the ground tenant on the property. A person close to the deal said the investment group closed yesterday on the purchase of the property, which is located at the corner of Sixth Avenue and 57th Street. This is the third major acquisition by David Werner this year. He purchased 5 Times Square for $1.5 billion and the leasehold for the Mobil Building at 150 East 42nd Street, for $855 million. Werner, Schron and the Cohen family’s Carlton Associates did not immediately respond to requests for comment. Insiders expect to see more pricey sales of land under co-op buildings with resets looming. In fact, the sale is being mirrored nearby with the marketing of the ground under the Trump Plaza at 167 East 61st Street, which has a rent reset in 2024. Eastdil Secured brokers Doug Harmon and Adam Spies have that listing. The co-op building has a ground lease that runs for another 51 years with the property owner, currently paying about $4.4 million per year. In approximately 10 years, the rent for the ground lease payments will reset. That reset will be based on market values. Ground resets typically price the new rent at about 6 percent of the current market value. Investment sales broker Robert Knakal, chairman of Massey Knakal Realty Services, estimated the value of the land to be at least $1,200 per square foot and up to $1,500 per foot, if the value of the retail is taken into consideration. Knakal is not involved in this property. At that value, the land with 377,000 square feet of development rights, would be worth $452 million. That could work out to an annual rent payment of $27 million per year, if reset today, according to an analysis by TRD. To help fund the purchase, the group obtained a $180 million loan from Natixis Capital Markets in a deal arranged by Drew Anderman, a senior managing director at the mortgage brokerage firm Meridian Capital Group, insiders familiar with the deal said. The landlord is recognized as a costly anachronism, whose moral claim, even to compensation for expropriation, is constantly getting weaker. —Matthew Arnold, quoted in London Daily News. Among no class of reformers do we find more clear thinking or a sounder political economy than among the "single-taxers." Following the writings of the late Henry George there is a considerable and important literature upon this subject. Land monopoly and speculation should be stopped. Labor should not be taxed. The resources of nature should be made to minister equitably to the whole people. Now the weakest pay the most tax. It should be the strongest and they whom the government most benefits. A single tax man of Baltimore, Mr John Salmon, expresses no little surprise that Senator Hanna's candidate for governor of Ohio supposes that the single tax has been a disastrous failure wherever tried. Of Mr Herrick and his notion Mr Salmon writes: This stamps him as being a twisted thinker and a loose observer. The single tax is in operation all over the United States, flowing into the pockets of private individuals, which is what single taxers object to. Here in Baltimore more than in any other section of the country, it is strongly apparent. We have the ground rent system in operation, 90 percent of the real estate being held on leaseholds. The custom is an old English one grafted on the Maryland colonies by Lord Baltimore and his English compeers, and it has grown and flourished like a green bay tree. When one buys a home here it is in nine cases out of ten subject to a ground rent. These ground rents are dealt in as a form of investment the same as a mortgage or any other form of investment; but the point to observe is that they are a single tax, pure and simple, the price paid for the use of the ground per se and for ground only. Our last assessment separated the value of the land from the value of improvements, and it is done every day in our community. Baltimore has more houses per capita than any city in the country, due to the ground rent system; and a house costing $1,200 to build is very often sold for $800 or $900 in order to create a ground rent ranging from three dollars a front foot to $20 and $40 a front foot. To explain more fully: Bonus buildings are run up on plats of ground split up into lots of 15x90, and a ground rent say of $6 per front foot is put on the lot, making $90 a year ground rent, which the buyer agrees to pay, and in his ground rent is a clause that he will also pay all taxes. This $90 is essentially a single tax. The agreement to pay it is exactly the same kind of a contract that is in vogue in Fairhope, Ala. With this extremely important exception, that whereas we in Baltimore bind ourselves to pay all the taxes, in Fairhope the company or lessor, agrees to pay all taxes. Talk of its being a disastrous failure! Not on your life. Ground rents are as scarce as hen's teeth, and can only be bought on a three percent basis. They command as good a price as government bonds, and it is estimated that $14,000,000 at least is raised in Baltimore alone from this source — nearly twice as much as the city and state taxes amount to. And what is this tax of $14,000,000 paid for? Why, merely for the privilege of living in the city of Baltimore. That's all the payers get for it. And the only kick we've got coming is that the private individuals get that money instead of the city and state. -- found in "The American Cooperator" (1903); "The Public" was a weekly newspaper, out of Chicago, edited by Louis F. Post, who went on to serve in Woodrow Wilson's administration. After all, nobody does implicitly believe in landlordism. Not only have land tenures an indefensible origin, but it is impossible to discover any mode by which land can become private property. The right of mankind at large to the earth's surface is still valid, all deeds, customs and laws notwithstanding. To turn a landed proprietor out of the seat you have once allowed him to occupy is about as pleasant a job as trying to root up a live oak with a pocket-knife. — E. C. GRENTVILLE MURRAY, The Member for Paris, p. 157. Landowners hate parting with their land. — MATTHEW ARNOLD, The Incompatibles, Irish Essays, p. 29. The economists have concluded from this that the landowners were the only masters of the situation, and that they could turn the nation out when they pleased. — SISMONDI, New Principles of Political Economy (1820), Book III., Chap. 5. We have the landowner first, who is always becoming richer. . . . But if you come to the laborers, who cultivate the land, by whose toils and whose sweat your tables are furnished with bread and with beef and with many other things that they produce, you find these laborers at this moment, I believe, at a comparatively greater distance from the landlord . . . than they were at any former period. — JOHN BRIGHT, Speech at Birmingham, January 26, 1864. The landlords have been revelling in prosperity — in a bloated and diseased prosperity — at the very time when the people have been suffering the greatest privation and want of food. "You are not making a gift of what is yours to the poor man, but you are giving him back what is his. You have been appropriating things that are meant to be for the common use of everyone. The earth belongs to everyone, not to the rich." 22. In the very first pages of Scripture we read these words: "Fill the earth and subdue it. "(19) This teaches us that the whole of creation is for man, that he has been charged to give it meaning by his intelligent activity, to complete and perfect it by his own efforts and to his own advantage. All other rights, whatever they may be, including the rights of property and free trade, are to be subordinated to this principle. They should in no way hinder it; in fact, they should actively facilitate its implementation. Redirecting these rights back to their original purpose must be regarded as an important and urgent social duty. 23. "He who has the goods of this world and sees his brother in need and closes his heart to him, how does the love of God abide in him?" (21) Everyone knows that the Fathers of the Church laid down the duty of the rich toward the poor in no uncertain terms. As St. Ambrose put it: "You are not making a gift of what is yours to the poor man, but you are giving him back what is his. You have been appropriating things that are meant to be for the common use of everyone. The earth belongs to everyone, not to the rich." (22) These words indicate that the right to private property is not absolute and unconditional. 24. If certain landed estates impede the general prosperity because they are extensive, unused or poorly used, or because they bring hardship to peoples or are detrimental to the interests of the country, the common good sometimes demands their expropriation. (20) Church in the World of Today, no. 69: AAS 58 (1966), 1090 [cf. TPS XI, 306]. (21) 1 Jn 3. 17. (22) De Nabute, c. 12, n. 53: PL 14. 747; cf. J. R. Palanque, Saint Ambroise et l'empire romain,Paris: de Boccard (1933), 336 ff. (23) Letter to the 52nd Social Week at Brest, in L'homme et la révolution urbaine, Lyon: Chronique sociale (1965), 8-9. (24) Church in the World of Today, no. 71: AAS 58 (1966), 1093 [cf. TPS XI, 308]. (25) Ibid., no. 65: AAS 58 (1966), 1086 [cf. TPS XI, 303]. Those interested in Catholic Social Thought should look for a new book which came out of a 2007 conference held at the University of Scranton, and edited by Professor Kenneth R. Lord of UScranton, entitled "Two Views of Social Justice: A Catholic/Georgist Dialogue." The version I've seen is the October, 2012, issue of The American Journal of Economics and Sociology, and I understand that it will be made available in other forms as well. Sixteen scholars have come together in this issue to examine eight social-justice themses from the perspectives of Catholic Social Thought and the philosophy of Henry George. The themes they address are natural law, human nature, the nature of work, the nineteenth-century papal encyclical Rerum Novarum, causes of war, immigration, development, and wealth, and neighborhood revitalization. While they sometimes wrangle with each other, their common aspiration is the same as their nineteenth-century predecessors,: to find solutions to the human suffering caused by injustice. And grind forever in gloom that the privileged few may live. — JOHN BOYLE O'REILLY, From the Earth, A Cry, The Statues in the Block, and Other Poems, p. 41. But too low the bread to eat. — ERNEST JONES (1819-1868), Song of the Lower Classes, Songs of Freedom, p. 127. That which is yet wanting on your part to be done is this, to see that the oppressor's power be cast out with his person; and to see that the free possession of the land and liberties be put into the hands of the oppressed commoners of England. The Law of Freedom in a Platform, or True Magistracy Restored. We . . . may solace our minds with the imagination of right-minded Englishmen . . . acting as a commission to draw up a list of the thoroughly bad landlords, . . . and then bringing their list back to London and saying, "Expropriate these, as the monks were expropriated, by Act of Parliament." — MATTHEW ARNOLD, The Incompatibles, Irish Essays, p. 33. The nobility and gentry and even those holy men, the abbots, not content with the old rents that their farms yielded, nor thinking it enough that they, living at their ease, do no good to the public, resolve to do it hurt instead of good. . . . As if forest and parks had swallowed up too little of the land, those worthy countrymen turn the best inhabited places into solitude. — SIR THOMAS MORE, Utopia (1516), Book I. A great landholder may legally convert his whole property into a forest or hunting ground, and expel every human being who has lived upon it. In a thickly populated country like England, where almost every acre has its owner and occupier, this is a power of legally destroying his fellow-creatures; and that such a power should exist, and be exercised by individuals, in however small a degree, indicates that as regards true social science, we are still in a state of barbarism. If you know how to defend your rights, if you accomplish your duty, this frightful disorder will cease, the human race, lifted up after its long downfall, will no longer be the property of a few tyrants, neither will the earth be their exclusive heritage. All will share in the good things destined by Providence for all. — ABBE LAMENNAIS, The Book of the People, Chap. XVI. You are in this world as strangers. Go north or south or east or west, and wherever you stop you will find a man to chase you away crying, "This is mine." And after you have gone through all the countries of the world, you will come back knowing that there is nowhere a poor bit of land where, as a matter of right, your wife can bring forth her firstborn, where you can rest after tilling the soil or where your children can bury your bones. — THE ABBE LAMENNAIS, Paroles d'un Croyant (1834), Chap. IX. "This dog belongs to me," said these poor children; "that place in the sun is mine!" Behold the beginning of all usurpation upon earth! — BLAISE PASCAL, Pensees, Article VI., Sec. 53. In love of home the love of country has its rise, and who are the truer patriots or the better in time of need — those who venerate the land, owning its woods and streams and earth and all that they produce, or those who love their country, boasting not a foot of ground in all its wide domain? — CHARLES DICKENS, Old Curiosity Shop, Chap. XXXVIII. It will be thought an intolerable thing that men shall derive enormous increments of income from the growth of towns to which they have contributed nothing — that they shall be able to sweep into their coffers what they have not produced — that they shall be able to go on throttling towns, as they are well known to do in some cases. It is impossible to suppose that the system will not be vigorously, powerfully, persistently and successfully attacked. —JOHN MORLEY, Speech at Forfar, October 4, 1897. The Times, October 5, 1897, p. 5, column 3. Has no one in California figured out that when the calf is deprived of mother's milk, starvation is inevitable? It has taken 34 years, but it is coming about. Feeding calves grain, or seaweed, or sunflower seeds isn't as smart as letting it consume its natural food. Taxing wages, sales and buildings isn't as smart as collecting the lion's share -- calf's share, if you will -- of the land rent for public purposes. Proposition 13 was designed to make sure that the cows' milk was kept for the Irvines, the big landowners, the commercial property owners, and the longtime homeowners, while providing a diminishing fifth of it to the calf and supplementing with grain, seaweed and sunflower seeds. The calf's digestive system has blown up because it was deprived of its proper food, and "nourished" with stolen fake food. To make America more egalitarian, tax the value of land - FT.com. Sir, Joseph Stiglitz is concerned that America has become less egalitarian, and no longer the land of opportunity (June 26). He mentions reducing rent-seeking as a solution, but he does not mention the paradigmatic form of rent-seeking: collecting the ground rents of land. If an increasing share of gross national product is going to the top 1 per cent, it is at least in part because they are the people who own most of the valuable land, and the rents of land are absorbing a larger share of production. No one is making more land to keep the price down by competition. — ADAM SMITH, Wealth of Nations, Book I., Chap. 6. This is a paragraph from a book written about 100 years ago about Dr. Edward McGlynn, a much-loved Roman Catholic priest in Manhattan (St. Stephen's Church) who, with Henry George, was active in the Anti-Poverty Society in the last 15 years of the 19th century. It comes from a section listing "Thoughts of Dr. McGlynn." It was told of a recently deceased Judge of the Supreme Court of the United States, a man who sat in the Senate of the United States, one of the most eminent men of his generation, how he, a poor lawyer, in a comparatively poor western town, had been able to accumulate some two or three millions of dollars worth of property. How? By "sagacity" in investing in lands at some distance from villages and towns, with foresight that in the course of a few years the growth of those communities, the industry, thrift, talent, virtue, patience of large communities would all keep adding to the value of his property, and in course of time cities, towns and villages would grow up on these lands, and he would be able to command an enormous price for land that cost him but a song. Now, while the law tolerated or even sanctioned what he was doing, he was guilty of an iniquity, of reaping where he had not sown, of exacting tribute where he had contributed nothing. Here's a piece from a 90 year old journal. There are acres in Manhattan whose value is far higher today -- and the landlords are still reaping what the working people and visitors to New York are sowing. There are portions of New York City in which the land is valued at $40,000,000 an acre. That means $8000 each day from each acre for the landlord, and that entirely unearned by him, before there is a penny for any other purpose. Probably not less than two and one-half million dollars a day, or almost a billion dollars a year, must be earned by the people of New York City and turned over to landlords for permission to use the island, which is a gift of nature, and for the advantages that are protected and maintained by the industry and enterprise of all of the people. Think what NYC -- and America -- would be like if that "permission to use the island" money was treated as our logical public revenue source, instead of as individuals', corporations' and trusts' private revenue source. Recall the wisdom of Leona Helmsley: "WE don't pay taxes. The little people pay taxes." For ages sorcerers and magicians kept their secrets, their charms and enchantments to deceive the simple and unwary. At length most of such marvels are relegated to jugglers and sleight-of-hand performers, and we are amused to be deceived. We expect to see things come out of nothing; to see the unbroken eggs come out of the beaten scarf; the guinea pigs come out of the empty silk hat, the ducks come quacking out of the empty box; silver dollars come out of the boy’s ear or empty pocket. But there is yet one piece of magic in which many still believe. That is the magic of land values materializing from a vacant rubbish-covered lot or tract of land on which not a lick of work has been done. Wherever there is in any country uncultivated lands and unemployed poor, it is clear that the laws of property have been so far extended as to violate natural right. The earth is given as a common stock for man to labour and live on. — THOMAS JEFFERSON (1785), Ford's Writings of Jefferson, Vol. VII., 36. To 'scape the pressure of contiguous pride? And e'en the bare-worn common is denied. — OLIVER GOLDSMITH, The Deserted Village. Without ties to bind the people to the land, they have been driven, especially of late years, in ever increasing multitudes to the towns. Here they have herded apart from the better classes, forming an atmosphere and a society marked on the one hand by an absence of all the elevating influences of wealth, education and refinement, and on the other by the depressing presence of almost a dead level of poverty, ignorance and squalor. They are not owners either of the scraps of land on which they live or of the tenements which cover them; but they are rackrented by the agents of absentee landlords, who know less of them than Dives knew of Lazarus. — CARDINAL VAUGHAN, Inaugural Address to the Annual Conference of the Catholic Truth Society, Stockport; published in the St. Vincent de Paul Quarterly, New York, November, 1899; p. 286. And half a tillage stints thy smiling plain. When once destroy'd can never be supply'd. Usurp the land, and dispossess the swain." Other excerpts from this poem appear in Crosby's Calendar, but this one does not. I hereby add it! Those who think that the land of a country exists for the sake of a few thousand land-owners, and that so long as rents are paid, society and government have fulfilled their function, may see in this consummation a happy end to Irish difficulties. But this is not a time, nor is the human mind now in a condition, in which such insolent pretensions can be maintained. The land of Ireland, the land of every country, belongs to the people of that country. — JOHN STUART MILL, Political Economy; Book II., Chap. 10, Sec. I.